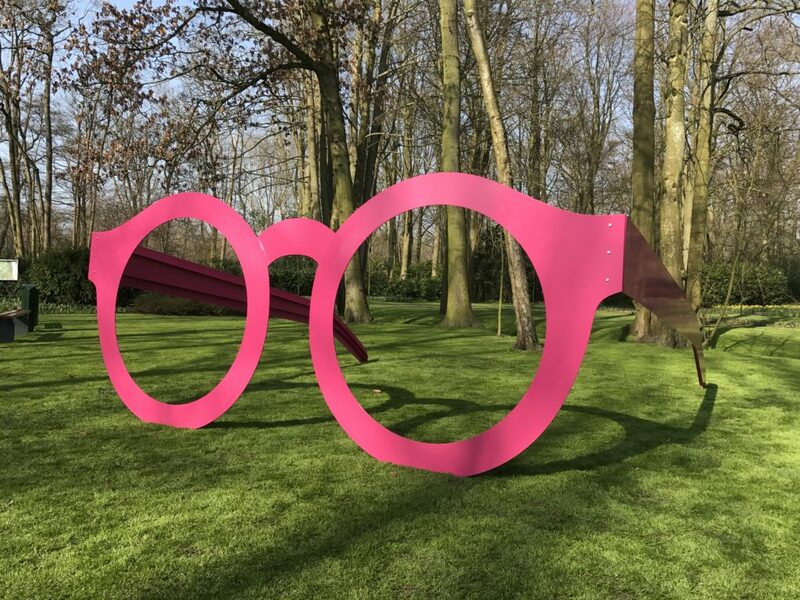 Our experience shifts when we look out through a frame, such as these pair of rose colored glasses. We choose our own boundaries of how we look at the world. The concept of La Vie En Rose is a tribute to perspectives. This installation invites the public to interact and become part of a new reality.This sculpture has a performance quality that crosses multi-cultural boarders. The public takes on poses through selfie shots and video as they interact with the frames. The underlying concept of the rose colored glasses was grasped on a visual and physical level as participants lined up to take a moment to document their own performance. The interaction showed bursts of play, joy, looking through the frame, cleaning our lenses, climbing a larger than life understood object, being a central core for family value and inspiration, and a common ground for friendship. A frame allows us to ponder how we see things around us. Eye glasses are about focus things inside the frame are sharp like a landscape filled with colorful tulips, or a historical royal palace. Right now, La Vie En Rose is on display in Apeldoorn, and will make its way to Where the Sheep Sleep!